Hello there! It's me, Per, the cat at The Hideaway. 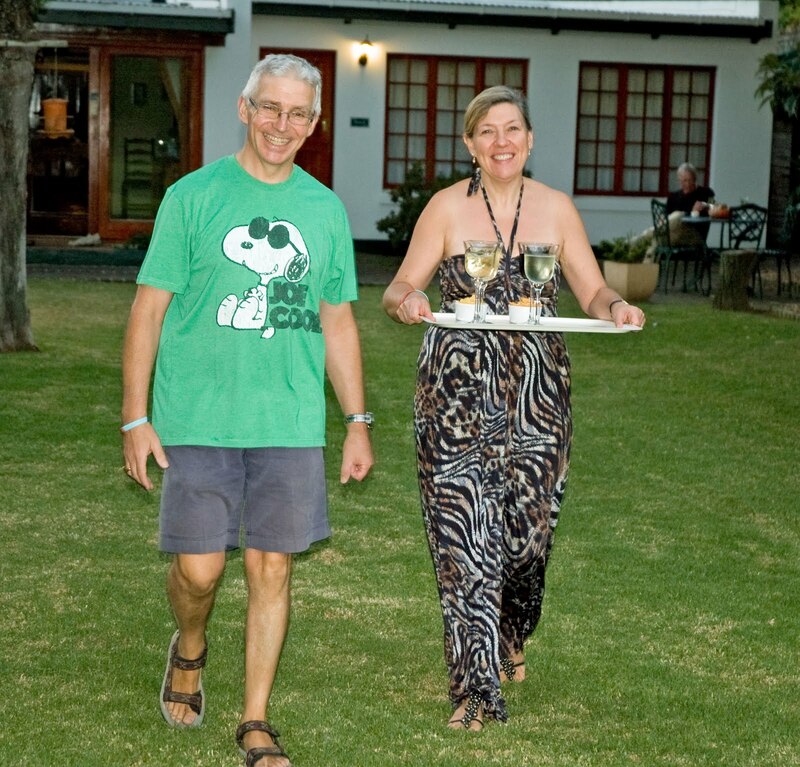 You know, the inexpensive little 5* B&B accommodation in Swellendam on the Garden Route in the Western Cape. We had a wonderful Christmas and New Year. 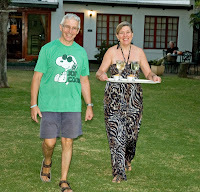 My staff, Jackie and Stephen, (that's them in the picture) have had lots of guests to stay including one lady called Vanessa who thought I was the cat's whiskers. She threatened to catnap me back to somewhere called England to meet Mr Smurf. I liked her, but England sounded cold and wet. Brrrr! Then we had a visit from Biggles and Beth-Anne who stopped by to refuel on the way to Cape Town. She spoke my language! She had obviously been studying Talking with Tails! I have been very brave with the ceiling fans in the house, they are sooooo scary, but I don't mind them so much now. But as if having them in the house was not enough, now they have attached them to tin boxes which roar and rumble about in the blue stuff above the garden! I have to run inside when I see one in case it gets me. My staff say its all about the fire in the Langeberg mountains, but I am not sure why there would be a fire there when it's not cold, we only have fires in the sitting room in the winter, and that's OK because the fans aren't running then. Very confusing, but then I am only a cat! Hmmm!